The Motion-Blur effect is used to create a faded trail behind objects animated on a motion path. 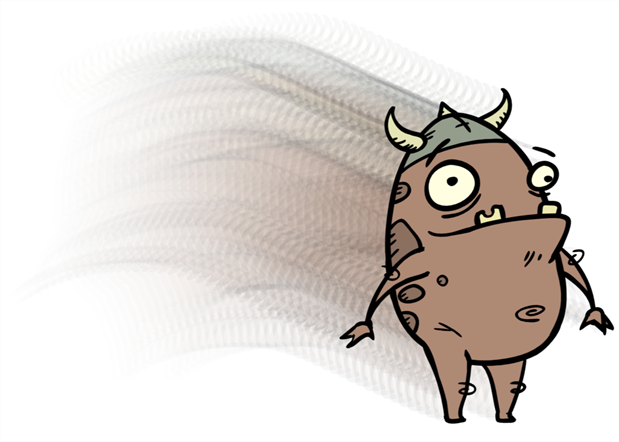 You cannot create a Motion-Blur on a hand-drawn animation. The layer must be moving along a trajectory (motion path) in order to work properly. 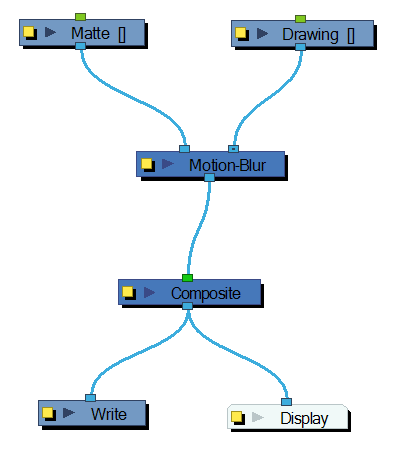 The Motion- Blur effect automatically creates a matte for the drawing layer attached to it, so it is not necessary to connect any matte into the Mask layer. 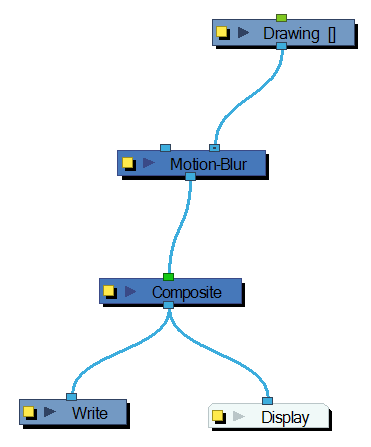 Use the Motion-Blur editor to modify the motion blur, crowd simulation or particle system effect. 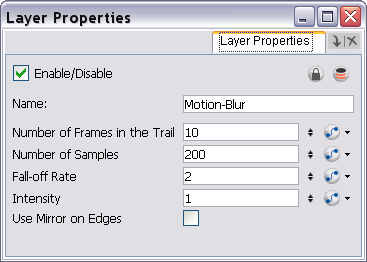 • Number of Frames in Trail: Number of frames before the current frame that will be used in the trail. • Number of Samples: Number of copies of each drawing used in the trail. The higher the number, the more continuous the trail appears. • Fall-off Rate: The distance where the blur fades from the edge of the image. Select a value between 0 and 1. • A fall-off rate of 0 causes the trail to fade out slowly, distributing the colour evenly from the edge of the character to the farthest edge of the trail. • A fall-off rate of 1 causes the trail to fade out quickly so that the trail is more opaque closer to the edge of the image and transparent at the end of the trail. • Intensity: Select a value to define the opacity of the trail between 0 and 10. A value of 10 will make the trail very dark and almost opaque, where as a value of 0 will make the trail quite pale and ghostly transparent. • Use Mirror on Edges: When enabled this option appear when the image is close to the edge of the camera frame. It forces the software to use a mirror of the image to calculate the blur so that it appears on both sides of the drawing object. Without this option once your drawing reaches the edge of the Camera frame, it gets cropped so does the trail.